Ok, I'm packing my bags and heading to Vegas. I'll be over there by dinner time and will check in at the Rio tonight. This means that I'll roll up my sleeves and start getting into some coverage. Stay tuned, and welcome to all the new readers who've found us. We're just launching this baby, so get read to have some WSOP fun! If there's anybody that you want me to look into over the next couple of days. Pros, or just people who you know are playing, hollar at me. I'd be happy to say hello and grab a pic of whoever you're following. Take Me to the Mansion...Poker Dome! The party for the Poker Dome was at Tao, but the action is going to be at the Tropicana on July 9! Believe it or not, I won a seat to play in the Poker Dome! Mansion Poker has been holding 1cent tourneys for the coveted televised seats, and I won mine through a PokerNews.com promotion. So, the pampering begins on Friday July 7th when they put me up at Caesars Palace. Wining, dining, limos, and a chance at $25,000. Speed poker? Bring it on. The taping will be on July 9th, but they won't air it on FSN until July 23rd. And you can bet that we'll be throwing a big party while we watch it in Vegas. Sound like fun? Take your shot at it on MansionPoker.net. There are plenty of seats still to fill. This sepcial poker TV series will be running for 43 weeks. Read more about it on BJ Nemeth's blog. Amy is the original poker scenester, Jen is merely her deciple. She's been playing poker longer than she's lived in Texas or been working on her PhD, and everyone knows her by her hat. 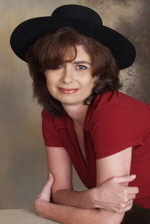 Amy is the former editor of PokerPages.com and continues to write for a variety of poker magazines and websites including BLUFF and Woman Poker Player. During the series Amy will be writing for PokerNews.com, and even if you don't see her hat, you'll recognize her devilish smirk. Amy loves playing Omaha hi-lo, and is a sucker for flush draws and blogging. Follow her adventures on and off the felt at "Aimlessly Chasing" Amy. In 2005, Jen moved to Las Vegas to watch the 2005 World Series of Poker and fell in love with both the poker world, and a poker player. She started off blogging for PPlayer which is now CardSquad, and now she writes for BLUFF and Woman Poker Player. Jen aspires to be the Rachel Ray of the gambling world and is working on an aritcle about poker rooms for ForbesTraveler.com, as well as her next humor book, The Girlfriend's Guide to Dating a Poker Player. 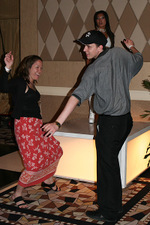 The picture on the right is Jen taking on a $50 prop bet to dance with a lone desperado on the dance floor at Doyle Brunson's 2005 appreciation party at the WSOP. BJ, Pauly, Jay, Amy, and John bet me the cashola to get out there and dance with the sad sap. How could I say no? Amy claims it was the best $10 she's ever spent. You can read a whole lot more about Jen in the Wicked Chops Poker Blogfiles. And yes, she'll be at the WPBT's Summer Classic!